An enjoyable, and creative way to pay homage to a tarot card and to gain fresh ideas about it is to use the card as a springboard for an acrostic poem. To do this, write a card’s name or its keyword vertically on the left side of your page then fill in the lines as spontaneously as possible, using the picture as added inspiration, if you like. This isn’t about creating literary masterpieces, but rather is about spontaneous expression, so just go with it. 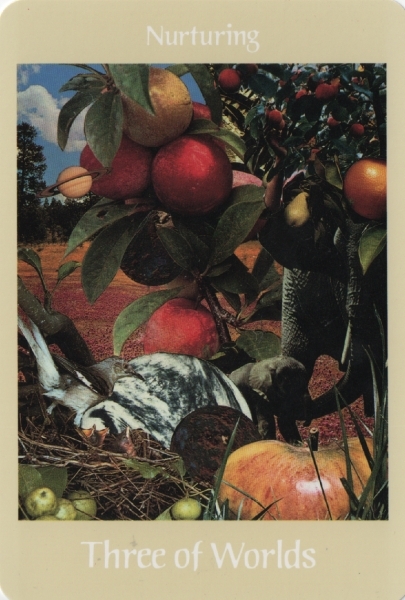 Here’s an example from the card I pulled for myself today, the 3 of Worlds from the Voyager Tarot. This morning, I chose to use the printed keyword, “nurturing”, as the basis for my acrostic poem. This piece is the fourth and final installment of my report on the recent tarot gathering in NYC. Please see my previous three posts for the others. Sunday, 26 April was wrap-up day for this year’s Reader’s Studio. I wasn’t able to attend Mitchell Osborn’s breakfast roundtable, How to Handle Family and Friends (and Clients) when they “Just Don’t Get What You Do” as a Reader/Psychic, but people told me that the discussion was enjoyable and useful. The tribe gathered in the ballroom and each person found hir original foundation reading partner from Friday. Barbara and I pulled out our notes and the cards from the beginning of the conference and took turns going over the spreads with fresh eyes. Ideas we discussed before were fleshed out and made even more clear by paying attention to natural elements as depicted in our layouts, by paying attention to our breathing, by offering thoughts of blessing to one another, and by concluding our sessions with the sacred gaze. 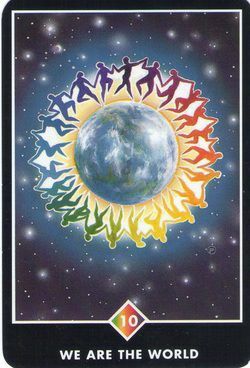 I felt truly helped and I perceived that my reading partner really witnessed a deep and authentic part of herself in the key card from her reading. This Readers Studio practice of revisiting the foundation reading after learning new ideas is valuable and demonstrates just how much a tarot practitioner can improve hir skills through an immersive experience. Ferol Humphrey invited various attendees to share their experiences. People contributed their thoughts and feelings about how the workshops, study groups, interactions with peers, and questioning their own assumptions opened them up as people and as readers of tarot. Heartening! Our morning concluded with an hour and a quarter of Tarot Incubators, a multi-table brainstorming session facilitated overall by me and at each topic’s specific table by several friends. This year’s Incubator table hosts were Wald Amberstone, Nancy Antenucci, Joanna Powell Colbert, Ellen-Mary Keough-O’Brien, Mellissae Lucia, Andrew McGregor, Heatherleigh Navarre, Beth Owl’s Daughter, Cheryl Ryder, Doug Reuschel, and Gina Thies. People were invited to go to the table whose topic would be most useful to them and to take part in discussion and Q & A about that topic. This year, we covered being specialists in aspects of tarot, the ins and outs of creating a deck, tarot for creative expression, using the cards for meditation and ritual, employing specific cultural concepts in tarot decks, embracing a cross-cultural approach to reading for people, building active tarot meet-up groups, and building an audience for one’s tarot practice. The conversations were lively and inspiring. At the end, participants were asked to state one thing they could take with them beyond the conference to help ground the ideas in reality. After lunch, certificates were handed out, Ruth Ann bade farewell to the elements/suits (always so moving), and we all thanked one another for the whole experience. A seamless, heart-centred, and effective Readers Studio had come to a close, but its wisdom and energy were carried forth into the world by all of us. 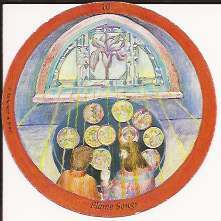 Images: 10 of Flame Songs from the Songs for the Journey Home Tarot; 10 of Rainbows from the Osho Zen Tarot. In this third installment about my recent trip to New York, I’ll cover the events of Saturday, 25 April, Day Two of the Readers Studio proper. See my previous two entries for the days that led up to it. So much goes on at the Readers Studio, that one can’t be at everything, so I didn’t make it to Marilyn Shannon’s breakfast roundtable on Using Tarot to be Fearless, Kind, and Happy, but by all reports it was very good. Nor did I make it to any of the rituals in the meditation room hosted by Carolyn Cushing, but once again heard that they were helpful. From 9:30 through 12:00, we all took part in Theresa Reed‘s wonderful session, How to Read Tarot Under Any Circumstance. Theresa’s intention was to give us tools and tips to help us remain calm, grounded, and clear-minded regardless of what’s going on so that we can be professional throughout any tarot encounter. We witnessed her capacity to do this as she fluidly carried on with the first part of her presentation despite snags with the audio-video equipment. Excellent walking of the talk! Theresa (aka the Tarot Lady) took us on a tour of the Seven Nightmare Clients — the Skeptic, the Downer, the Hysteric, the Creep, the Bully, the Penny Pincher, and the Trigger — complete with fun cartoons and real-life stories. They were hilarious because so many of us have, at some point, worked with many or all of them. We were offered clear advice on how to deal with each. In addition to being a tarot reader, Theresa is a yoga teacher, so she offered a variety of yogic techniques to help us read cards even under stressful circumstances. The breath, focused concentration, and visualisation all came into play. Each practice was/is simple and effective. We were given an opportunity to practise the concepts with a partner, alternating roles of tarot reader and difficult client. Enjoyable and revealing. Theresa strongly encouraged us to set and stick to clear policies and boundaries around what we’re happy to do readings about, what we won’t do readings about, how people need to book sessions with us, how they should not book sessions with us, what happens if querents cross boundaries, and much more. Her advice to keep our policies in plain view of ourselves was wise; it can be easy to slip into “loosey-goosey” mode around them. How to Read Tarot Under Any Circumstance was a polished, enjoyable, and user-friendly workshop that I know all of us will refer to again and again. If you could leave this session with an answer or a sense of clarity, what would it be? What if we let our passion piece look at us and talk to us? Are you giving equal focus to the human/soul experience? What is my highest wish for myself? Is this highest wish really mine? What did you do as a child that made the hours pass like minutes? Herein lies the key to your earthly pursuits. (This one was from C.G. Jung). What’s waiting on the other side of that old story/distraction? Ace of Wands. What love poem does my soul want to recite to me? 10 of Cups plus a couple of slips of paper pulled from an envelope of words (See my poem below). What does my soul want me to know? 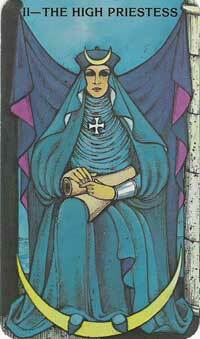 Queen of Swords. How will I be a vehicle for my soul’s mission (in one word)? Prince of Discs. We concluded with soul-gazing, five to ten minutes of looking into another person’s eyes, a profound act of witnessing that is a journey beyond the verbal. Tears streamed down my face as my workshop partner and I beheld one another’s essence and I received an even larger, richer vision of who my soul says I can be. Life-giving stuff! In between workshops, I gave private readings using the Thoth, Gorgon’s, Medicine Woman, and Voyager decks. Yet again, it was an honour and a privilege to help people unpack layers of story and gain support through the language of the tarot. Praise Life! Saturday concluded with a sumptuous four-course dinner and a dance party that gave us a chance to relax, let loose, and blow off some steam. It was a treat to move the body, enjoy some music and a drink, and connect with people socially. Aahh! 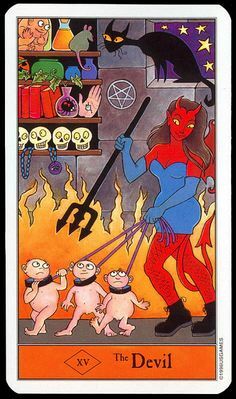 Images: The Devil from the Halloween Tarot; the High Priestess from the Morgan-Greer Tarot, and the 10 of Cups from the Thoth Tarot. Today, in Part Two of this four-part series, I’ll talk about my tarot-licious time in New York as it unfolded on Friday, 24 April. To read Part One click HERE. Friday marked the beginning of the Readers Studio proper. During and after breakfast on the 24th, the place was abuzz as those of us already in the Marriot greeted those who were arriving and as Registration and the ever-popular Merchant Faire opened. Goodies galore — tarot decks, books, bags, cloths, jewellery, candles, and more — called out for our attention (and wallets!). Ruth Ann Amberstone started the proceedings with a simple ritual, inviting the best qualities of the four elements and tarot suits to be present at our gathering as she held up each emblem and others drummed and rattled. This uncomplicated ceremony that Ruth Ann performs every year is deeply penetrating and sets just the right tone. During the Meet the Instructors interviews, our three key presenters — Ellen Lorenzi-Prince, Theresa Reed, and Carrie Paris — responded to questions in ways that allowed the assembly to get to know them better as people as well as tarot practitioners. They whetted our appetites by revealing what their topics would be. The Tarot School encourages presenters to keep topics under wrap until the conference itself in case fresh, exciting material comes forth that the teachers want to include without being bound to something that’s already in print. This is genius at its most realistic. All of us were then encouraged to pair up with someone in the room and do short readings for one another. This was the foundation reading, the consultation one does at the beginning of Readers Studio and revisits on the final day to see how skills have improved over the course of the weekend. Another bit of Amberstonian genius! My partner for the foundation reading was named Barbara. I did an original four-card spread for her question using the Motherpeace Tarot. She read for me using a 10-card pyramidal layout and the Rider-Waite-Smith deck. Barbara’s fluency with the cards and her confident delivery addressed my topic (“What is the fresh mystery that is calling me?”) very neatly. The substantial buffet lunch nourished me so that I could do a couple of private readings for people on Friday afternoon, one with the Fountain Tarot, the other with the Voyager Tarot. Warmth filled me as the readees and I put everything together in meaningful ways. What a privilege! What is my ideal form of expression at this time? What does authentic humility look like for me at this time? What keeps me alive at this time? With what/whom is it helpful for me to merge at this time? 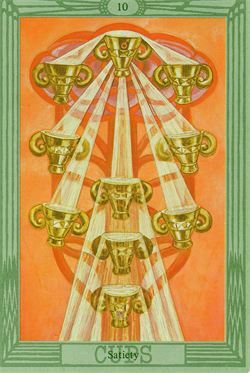 The cards I drew at random from the Thoth Tarot really “rang” for me and gave me a helpful map with regard to those parts of myself. 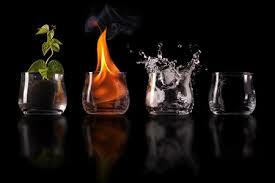 This session closed with a final guided meditation during which we noticed where each element supported us. 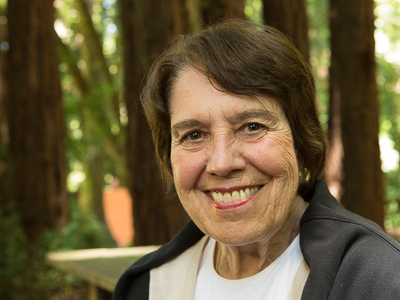 As ever, Ellen Lorenzi-Prince took us to profound places in ourselves, in the tarot, and in the cosmos with restrained grace. After some meaningful discussion, I led the 15 people through a four-card layout to help them discover how their tarot readings best embody all four energies. This was accompanied by corresponding meditation postures and instruments: rattle, drum, bell, and sticks. After we thanked and released the Supportive Beings, all felt that something worthy and transformative had taken place. I felt honoured and blessed. A small drink and some conversation with friends brought Friday to a happy close before I retired for the night.